Bobbins are the cement that holds embroidery stitches together, so they play an important role in the outcome of every machine embroidery design. Here is an overview of what you need to know about bobbins. Bobbins are not one-size-fits-all. They are available in three basic sizes for home embroidery, A, L, and M, (size L is the most common) and are specific to the machine on which they are used. They vary in both diameter and depth. Your embroidery machine probably came with several bobbins, so chances are you may not even know what type of bobbin it uses. Check the owner's manual to be sure before purchasing empty or pre-wound bobbins. Otherwise, Superior Threads has a wonderful bobbin compatibility chart. Bobbin thread is more fine than regular embroidery threads. Occasionally, embroiderers will use the same weight thread in the bobbin as that with they are stitching, particularly when creating freestanding lace or freestanding applique. Typically bobbin thread are either 50, 60 or 100 weight. The heavier the thread, the less that is wound on the bobbin. So a bobbin will hold more 100 weight thread than a 50 or 60 weight thread. 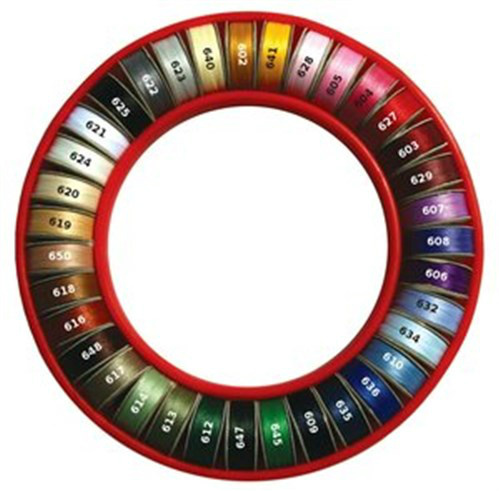 Like regular embroidery threads, bobbins also are available in polyester, silk, cotton, and monofilament polyester. What is the better buy? To wind your own bobbins from a 1100-yard spool of popular 60 wt. bobbin thread at $8.49 or a box of 144 pre-wound bobbins at $46? Actually, it is the pre-wound bobbins. Pre-wound bobbins are very convenient. When bought in bulk, they are also very economical, as little as 32 cents each. Even better, because they can be wound so much tighter, pre-would bobbins hold three times the amount of thread of their home-wound counterparts. At that rate, the box of 144 pre-wound bobbins is actually the equivalent of 432 that you would wind at home. Another difference in bobbins is the bobbin itself. Pre-wound bobbins come in plastic, metal, and cardboard, another reason embroidery machines only use particular types. Bulk bobbins from Coats and Nebs are available in colors of all black and all white. 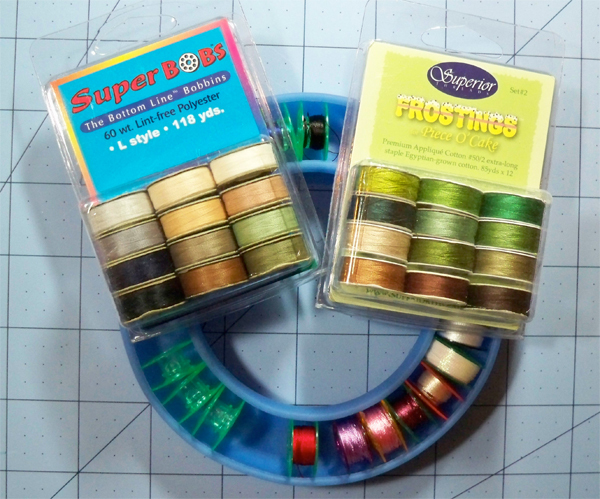 For color pre-wound bobbins, there is no better choice than SuperBOBS from the industry thread expert, Superior Threads. Thirty-five L bobbins come in a donut bobbin holder. Wound with Superior's Bottom Line thread, the 118-yard bobbins are lint-free, 60 wt. polyester. A Frosted Doughnut contains 35 type L bobbins of Superior's MasterPiece thread. Unless you have spares on hand, it is inconvenient to stop mid-project when a bobbin runs out. The next best thing is a stand-alone bobbin winder. The award winning SideWinder eliminates the need to unthread your sewing machine when you need to wind a bobbin in the middle of a stitch out. It is small, making it portable, and runs on electric or battery power. Another option is the Better Bobbin Winder. Be sure to check compatability as some bobbins will not work with bobbin winders. When you look at the abundance of thread you have on hand, it only makes sense that the amount of bobbins would also be monumental but not nearly so easy to store. The bobbin holders above work well. Stack 'n Store Bobbin Towers hold 30 bobbins in stackable spoked clips that prevent all of those annoying thread dangles and tangles. There is also a great bundle combining the SideWinder and two Stack 'n Store Bobbin Towers. Pat also had some bobbin storage ideas in a recent blog. Debbie, You are very thorough in your view of bobbins. I have always used pre-wound and another reason is that these bobbins are more evenly wound. A home winder is subject to some variance which is not good for embroidery. Just a little slack in the upper or bobbin thread and a project will take a lot of time to remove or adjust something that has gone wrong. Sometimes we forget just how much our time is really worth. It is best to refer to the manual for the correct bobbin size as well as bobbin thread weight. Wow. How's that for timing. I LOVE pre-wound bobbins, mainly because I'm lazy!